The AIM-9 has a cylindrical body with a roll-stabilizing rear wing/rolleron assembly. Also, it has detachable, double-delta control surfaces behind the nose that improve the missile's maneuverability. Both rollerons and control surfaces are in a cross-like arrangement. The missile's main components are an infrared homing guidance section, an active optical target detector, a high-explosive warhead, and a rocket motor. The infrared guidance head enables the missile to home on target aircraft engine exhaust. An infrared unit costs less than other types of guidance systems, and can be used in day/night and electronic countermeasures conditions. The infrared seeker also permits the pilot to launch the missile, then leave the area or take evasive action while the missile guides itself to the target. In September 1958 Chinese Nationalist F-86s fired the first Sidewinder air-to-air missiles to down 11 communist Chinese MiG-17s over the Formosa Straits. Until that time, aircraft defensive means where primarily limited to pilots and tail gunners firing small caliber ammunition in dog-fight situations. On September 24, 1958, the PLA air force fighter units rose from the airfields for another combat mission toward Taiwan. The second crisis of the Taiwan Straits was in full swing, and air skirmishes over neutral waters became almost regular. In these battles, MiG-17, which were in service with the People's Republic of China, actively demonstrated their superiority over the older F-86 of the Taiwan Air Force: at a greater speed, the PLA machines could dictate the distance and choose the moment to attack, and the greater range of the 37-millimeter guns H -37D compared with the 12.7-mm machine guns "Sabres" allowed the Communists not to be substituted for retaliatory strikes. As a result, the airs of the air duels were usually favorable for the PLA. But this time something went wrong. The fighters that rose from the airfields of mainland China returned in disorder, fairly battered, bearing losses. The pilots reported that the blame for everything was the use by pilots of Taiwan of a fundamentally new weapon - guided Air-to-air missiles. Nobody yet knew that on that day the history of one of the most famous types of guided weapons began. Emerged in the 1950s, this missile is still in armament, and even with the most advanced and technologically advanced powers. Sidewinder started in 1950, at the Naval Ordnance Test Station of the US Navy. As part of the initiative project, the engineers of the Center developed a project of a very simple and cheap infrared homing head, suitable for installation on aircraft missiles. In fact, the US Navy already had one missile program - developed since 1947 AAM-N-2 "Sparrow". But the rocket, eventually adopted for service in 1956 as "Sparrow I", was in general quite a clumsy, forced decision that had little in common with the subsequent family of AIM-7 Sparrow III missiles. The progenitor of the "Sparrow" family had a "beam-riding" method - that is, the rocket moved toward the target in a straight line, drawn by a rotating radar beam. For stable guidance, it was required that the pilot of the carrier aircraft constantly keep the target in sight all the time the missile was flying. The range of application was small (since the expansion of the radar beam led to a decrease in accuracy), and in addition, the system could not be used at all at low altitudes, since the reflection of the rotating beam from the surface of the earth or water completely knocked the missile to confusion. As a result, already in 1950 it became clear that "Sparrow-I" would be no more than a temporary solution. She was replaced by a "Sparrow-II" missile, with active radar guidance, but there were already many technical problems. Therefore, when the engineers of the Center suggested that the Navy command create a very simple and cheap air-to-air missile by installing an infrared homing head developed by them in an initiative order for a conventional FFAR (also known as Mighty Mouse) airborne missile, the admirals agreed without hesitation. The first "Sidewinder" was born exclusively as a combination of temporary solutions and "cheap" technologies. In fact, it was still the same FFAR, which was installed by the IR GOS and an autopilot connected to the steering planes. The infrared head, developed by NOTS engineers, was the main "highlight" of the project: American designers used the innovative solution for those times, making a conical scan with a rotating mirror that cast reflected IR rays onto the stationary photocell placed in front of it. Although for the US and in general the world rocket industry such a design of the GOS was a novelty, for the first time the idea of ? ?a rotating mirror with a stationary thermoelement was created by the Japanese, who developed in 1944-1945 a self-guided infrared bomb "Ke-Go". By using the concept of a rotating mirror and a fixed photoelement based on lead sulphide, NOTS designers succeeded in achieving a very high cheapness and compactness of the sensor head. The guidance was not on the current position of the target, but the displacement of this position in the interval between the scans (if it did not exceed 5 degrees, the autopilot did not respond). Due to this, the rocket did not "chase" the target, but followed the interception point ahead of time. To stabilize the missile, the engineers of NOTS proposed (for the first time in the world) a very simple and easy solution both in terms of implementation and in terms of weight - the Rollerons. Mounted on stabilizers, the rollers were unwound by the oncoming airflow, and created a gyroscopic effect, preventing (purely physically) tipping or rotating the rocket. The installation of roller skaters made it possible to avoid the need to equip the rocket with a complex mechanical autopilot and significantly save weight. The result was a very cheap and light (the weight of the first models was less than 70 kg) aircraft homing missile, for the first time in the history of air-to-air missiles, fully implementing the principle of "shot-and-forget." The shell that captured the target did not need any control from the side of the carrier aircraft. On the rocket was mounted 4,5-kilogram warhead, powered by a double (infrared / shock) fuse. The range was about 4.5 km. The development process has produced increased capabilities with each missile modification. The AIM-9A, prototype of the Sidewinder, was first fired successfully in September 1953. Production of the rocket began in 1955, and in 1956 the first model under the designation AIM-9A entered the armament of the fleet. In general, it was just a prototype: the release of model A was only 240 pieces, intended mainly for training pilots and training air combat techniques. The AIM-9B, the initial production version, entered the Air Force inventory in 1956 and was effective only at close range. It could not engage targets close to the ground, nor did it have night-time or head-on attack capability. These shortcomings were eliminated on subsequent versions. The viewing angle of its tiny sensor was only 4 degrees, That is, at launch, the pilot was required to accurately aim the aircraft's sight at the target. The speed of the conical scan was very slow, in addition, the uncooled rocket missile had a low sensitivity and was highly prone to extraneous heat. Recommendations for use limited its operation solely to firing on non-threatening targets (like bombers), only from the aft (so that the missile fired the thermal radiation from the target engines) and only with the sun on the side or behind. Nevertheless, the rocket was very active, and from 1958 to 1962 more than 80,000 pieces were produced. It was these missiles that were used by Taiwan in 1957 as an attempt to equalize the position of forces in the air. The Sidewinder AIM-9A missile was placed in Fleet use in 1956. A non-propulsive attachent (NPA) for the MK 15 motor was provided on the assumption that the assembled missile would be less hazardous to personnel and material, if the rocket motor were inadvertently ignited. The same NPA was used in the AIM-9B version of Sidewinder. This NPA has always been a source of confusion and argument. The AIM-9C used in Vietnam with a semi-active radar was tied exclusively to the F8 radar and fire control system and was deployed only in the 27C class CVA. A total of about 1,000 AIM-9C missiles were fired from 1965 to 1967, but their use in Vietnam proved unsuccessful. Low altltude performance was inhibited by the altitude line and performance below 10,000 feet was marginal. No further procurement was planned. A filter modification program (to provide high altitude capability up to 60,000 feet) in units being reworked was the only planned modification program. Fleet confidence in the AIM-9C was spotty, adn by 1969 logistics support was deteriorating. The AIM-9D used in Vietnam was the first in the world to have a liquid nitrogen-cooled seeker. The angle of view of the seeker was also reduced to 2.5 degrees, which allowed to eliminate the influence of foreign thermal interference. As a result, the range of the missile could be increased to 18 kilometers. By 1968 the primary problem was that of AIM-9D breakup. Possibilities for failure were all under examination - such as joints at all sections; clamp rings, depth of joint groove, launcher lugs, locks, and latches, and loading and handling procedures. The misfire rate of the Sparrow missile increases from 2% during controlled firings at NAVMISCEN to approximately 25% during combat firings. Extensive redesig;l of the launching system failed to eli~inate or decrease the high misfire rate. The other ejection launched missiles in operation maintain a motor fire reliability of 97-98% with the primary difference being in the method of applying motor fire. The Sparrow misfire problems were attributed to the reel and connectors providing the motor fire pulse to the rocket notcr during ejection. All other ejection launched missiles provide motor fire from interne1 missile power and avoid this complexity. The fire control mechanization for the F4/SPARROW Weapons System was optimized for the Fleet Air Defense environment. The equations were detemined and mechanized for a aedium altitude engagement against a non-maneuvering target. This mechanization compensates for altitude and closing velocity, to provide acceptable firing parameters throughout the entire altitude regime. The mechanization cannot depict the firing parameters for a maneuvering target because of the changing size and shape of the maneuvering target envelope. The AIM-9E attracted the attention of the Air Force, which did not like the idea of ? ?cooling with liquid nitrogen. Instead, AIM-9E used cooling with thermoelectric converters. 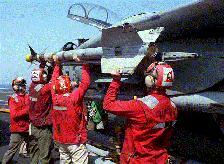 About 5000 rockets of old models were redesigned in AIM-9E, but the missile was not used outside the US Air Force. The AIM-9G provided the capability to lock on and launch against a target offset from the axis of the launch aircraft. At the end of the Vietnam War, in 1972 a new AIM-9G missile was created, which has a connection with the on-board computer of the carrier aircraft, and was capable of capturing the target according to the data coming from the airborne radar. There was no need to catch the proprietor in sight, so that the seeker seized the target: now it was enough to take the target to accompany the airborne radar, and the missile automatically received pre-launch instructions. The speed of conical scanning was also significantly increased. Several AIM-9G missiles were used in the final battles over Vietnam, and demonstrated excellent efficiency, "almost leveling up with all the other rockets put together." About 2,000 rockets were fired from 1972 to 1975. The AIM-9H configuration replace vacuum tubes with solid-state modules and a thermal battery replaced the turbo-alternator. 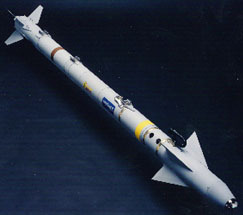 The AIM-9H was configured with a continuous-rod bundle warhead. The AIM-9J, a conversion of the AIM-B and E models, has maneuvering capability for dogfighting, and greater speed and range, giving it greater enhanced aerial combat capability. Its main difference was the replacement of old-fashioned tube electronics with microchips. This made it possible to dramatically improve the accuracy and reliability of electronics, increase the unpretentiousness of the rocket (and so, in general, not capricious). About 10,000 rockets were built from 1975 to 1977, mostly by remaking old ones. Deliveries began in 1977 to equip the F-15 and other Sidewinder-compatible aircraft. The AIM-9L added a more powerful solid-propellant rocket motor as well as tracking maneuvering ability. Improvements in heat sensor and control systems have provided the AIM-9L missile with an all-aspect attack capability and improved guidance characteristics. The L model was the first Sidewinder with the ability to attack from all angles, including head-on. An improved active optical fuze increased the missile's lethality and resistance to electronic countermeasures. A conical scan seeker increased seeker sensitivity and improved tracking stability. The AIM-9L is configured with an annular blast fragmentation warhead. Production and delivery of the AIM-9L began in 1976. The all aspect heatseeking Lima model of the established AIM-9 Sidewinder missile was one of the most significant air combat weapons of its time. The AIM-9L did not require a tail chase position to lock on to a tailpipe, and could lock on from any angle including 12 o'clock ie head-on. Soon after deployment the AIM-9L proved that existing air combat tactics were obsolete, since instantaneous turning performance became far more important than sustained turning performance. The ability to point the aircraft's nose at an opponent and quickly fire a missile became far more important than the ability to follow through multiple turning maneuvers to acquire a tail aspect gun/heatseeker firing position. While a tail aspect position did improve the AIM-9L kill probability by reducing the target's evasive maneuver options, the AIM-9L's all aspect performance was still superb, as learned the hard way by the Argentine and Syrian air forces in 1982. The AIM-9M missile utilizes a guidance control section with counter-countermeasures and improved maintainability and producibility. The AIM-9M is configured with an annular blast fragmentation warhead. The AIM-9P, an improved version of the J model, has greater engagement boundaries, enabling it to be launched farther from the target. The more maneuverable P model also incorporated improved solid-state electronics that increased reliability and maintainability. Deliveries began in 1978. The AIM-9P-1 has an active optical target detector instead of the infrared influence fuze; the AIM-9P-2 added a reduced-smoke motor. The most recently developed version, the AIM-9P-3, combined both the active optical target detector and the reduced-smoke motor. It also has added mechanical strengthening to the warhead as well as the guidance and control section. The improved warhead uses new explosive material that is less sensitive to high temperature and has a longer shelf life. The AIM-9M, currently the only operational variant, has the all-aspect capability of the L model, but provides all-around higher performance. The M model has improved defense against infrared countermeasures, enhanced background discrimination capability, and a reduced-smoke rocket motor. These modifications increase ability to locate and lock-on a target and decrease the missile's chances for detection. Deliveries of the M model began in 1983. The AIM-9M-9 has expanded infrared counter measures detection circuitry. The AIM-9X Sidewinder Air-to-Air missile program will develop a short range heat seeking weapon to be employed in both offensive and defensive counter-air operations. Offensively, the weapon will assure that US and combined air forces have the ability project the necessary power to insure dominant maneuver. In the defensive counter-air role, the missile system will provide a key capability for force protection. The multi-service Air Intercept Missile (AIM-9X Sidewinder) development will field a high off-boresight capable short range heat seeking missile to be employed on US Air Force and Navy/Marine Corps fighters. The missile will be used both for offensive and defensive counter-air operations as a short range, launch and leave air combat missile that uses infra red guidance. The AIM-9X will complement longer range radar guided missiles such as the Advanced Medium Range Air-to-Air Missile (AMRAAM). The AIM-9X system design approach incorporates a fifth-generation staring Focal Plane Array seeker for robust guidance performance, and Infrared Countermeasure resistance and jet vane control for extremely agile turning performance.